Sometimes Mother Nature needs a helping hand. That’s been especially true in Michigan when it comes to replenishing lost fish populations and establishing new ones in the Great Lakes and inland waters. Sometimes Mother Nature needs a helping hand. That’s been especially true in Michigan when it comes to replenishing lost fish populations and establishing new ones in the Great Lakes and inland waters. By the late 19th century, fish had begun disappearing due to habitat destruction, over-fishing, dam construction and pollution. Intensive management practices then became necessary to stop the losses and restore fish populations. 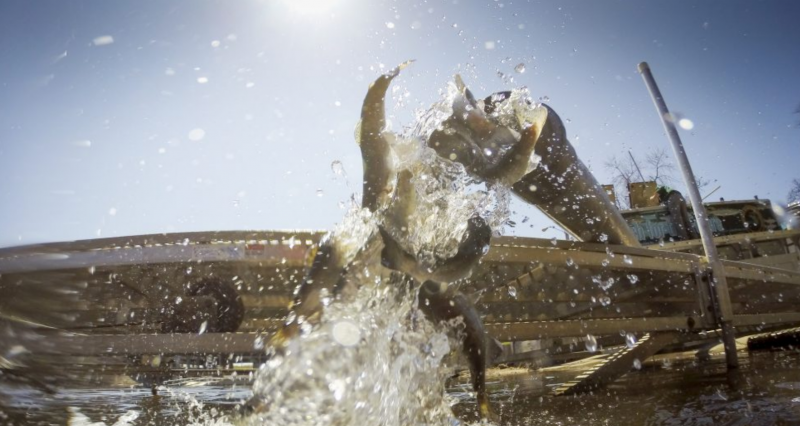 For more than a century, fish hatcheries have played a key role in those efforts. In 2016, the Michigan Department of Natural Resources (DNR) put more than 34 million fish, weighing a total of more than 350 tons, into Michigan’s waters. Forty percent of all Michigan recreational fishing, including 70 percent of the Great Lakes trout and salmon fishery, depends on stocked fish. “Certainly the big fisheries we have in the Great Lakes and many inland areas – Chinook, Coho, steelhead, Atlantic salmon and brown trout – are all non-native species to Michigan, but are here thanks to our fish-stocking program,” said Ed Eisch, DNR fish production manager. Fish stocking is a critical activity of the DNR. Not only does it help provide diverse fishing opportunities; it also helps support Michigan’s economy. “Recreational fishing in Michigan is a $2.5 billion industry, with 38,000 jobs that are directly attributed to our fishing industry,” Eisch said. In Southeast Michigan, the Lake St. Clair Walleye Association (LSCWA) assists the DNR in its stocking efforts by operating two walleye rearing ponds at Selfridge Air National Guard Base near Mount Clemens. Each April, the DNR releases a total of 300,000 walleye fry in the association’s two ponds, each of which is the size of a football field. The club’s members monitor the fish for six to eight weeks. “The walleye fry are one to two inches long when they arrive in our ponds and about four to six inches when they’re taken out again by the DNR and stocked in lakes all over the state of Michigan,” said the LSCWA’s Tim Muir. Since its inception 41 years ago, the Lake St. Clair group has reared more than 3 million walleye, Muir said. Statewide, 26 million walleye spring fingerlings and fry were stocked this year. The DNR and tribal partners rear these fish in ponds with extensive support from local sportsmen’s organizations. In Michigan, there are six state and two cooperative hatcheries that work together to produce the species, strain and size of fish needed by fisheries managers. These fish are then delivered at a specific time and location for stocking to ensure their success. Most fish in Michigan are stocked in the spring. Michigan’s fish production is possible through the work at its six fish hatcheries, three permanent egg-take stations, and numerous rearing ponds. Last spring, Thompson State Fish Hatchery near Manistique, for instance, stocked more than 1 million fish including steelhead and Chinook salmon. 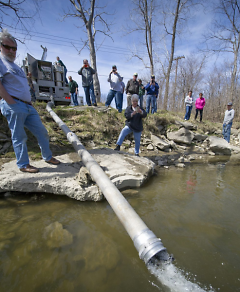 Those fish were then planted at 68 sites statewide, most of those located on the Great Lakes. Fishing has a direct impact on the health of all of our state’s abundant wildlife and natural resources. Hunting and fishing license sales generate the primary source of funding for conservation work. Wildlife management is not funded through state taxes. Not only are fishing and hunting license fees used to stock lakes and pay for species conservation and wildlife reintroduction programs; they’re also used to preserve Michigan’s beautiful forests, lands and river quality. Since wildlife is a renewable natural resource with a surplus, all anglers and hunters help keep wildlife populations at a healthy balance for the habitat through regulated hunting and fishing. Fishing regulations establishing the season, number and size of fish caught is another tool used to protect and sustain species. Today the work continues to preserve Michigan’s outdoor heritage. The Michigan Wildlife Council was created in 2013 to increase non-sportsmen’s knowledge about how wildlife and Michigan’s outdoors are managed and funded, and the role sportsmen and sportswomen play in preserving Michigan’s great outdoor heritage for future generations.